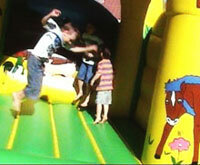 Our jumping castles are very popular for every type of event. Indoors, Outdoors in a backyard, Public Park or Car Park you can keep the kids entertained for hours on one of our jumping castles! For Darwin’s best range of jumping castles think of us first, Darwin Jumping Castles. You can Contact us on 8988 6767/0402 385 758 or email jump@darwincastles.com.au to ask a question, find out more or book your next castle hire.